Today’s NCAA championship game between a pair of ECAC teams, Quinnipiac and Yale, is the first all-Eastern final since Maine topped New Hampshire in 1999 and will be the third in the past 28 seasons. 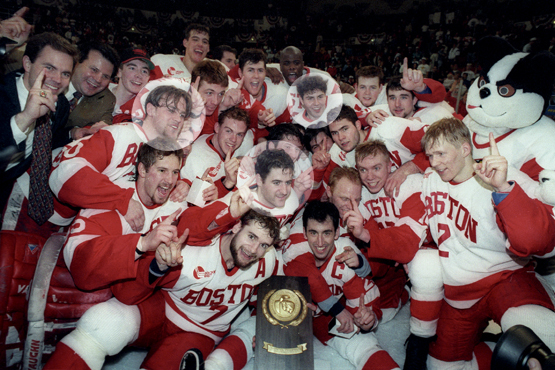 The other one was BU’s 1995 NCAA title game win, 6-2 against Maine at the Providence Civic Center. The last time an ECAC team played in the championship game was in 1990. Colgate lost to Wisconsin in the final, two days after the Red Raiders edged BU in the semifinal, 3-2. The loss ended a BU post-season run that produced wins in three best-of-three series; in each case the Terriers dropped the first game and won the next two. Next week, we’ll post the latest in our Terrier Tales series, a look-back at the remarkable 89-90 season, "Rebuilding The Foundation," authored by blog contributor mh82. Don’t miss it. The last time two ECAC teams met for the NCAA championship was in 1978 when BU defeated BC, 5-3, the only time the Commonwealth Avenue rivals met in college hockey’s title game. It was the first of three BU titles with Jack Parker behind the bench. BU participated in two other all-Eastern championship games. The first was in 1967, a 4-1 loss to Cornell led by goalie Ken Dryden, three months after the teams had played a legendary 3-3 double overtime tie in the Boston Arena Christmas Tournament. In the second, the Terriers turned the tables on Cornell, with goalie--and tournament M.O.P.--Tim Regan blanking the Big Red, 4-0, at a sold-out Boston Garden in Coach Jack Kelley’s final game behind the BU bench. 2013 recruit Jarrid Privitera scored his 15th goal in Dubuque’s 3-2 win against Omaha. He has a 15-10-25 for the Fightin Saints. The Lancers were without 2013 recruit Robbie Baillargeon who is recovering from an appendectomy. No, this is not a re-run of an earlier post.Alex Chiasson scored a pair of goals and earned first-star honors as Dallas thumped Nashville. 5-2. The right wing, who now has five goals in five NHL games, converted a goalmouth pass in the second period and then connected on a wrist shot for an unassisted goal in the third period. Colin Wilson’s season is over due to a shoulder injury that will require surgery. He’s been sidelined since March 9 and was the Predators’ top scorer with 7-12-19 when injured against Minnesota. Kevin Shattenkirk scored his 4th goal of the season in the Blues’ 4-1 loss to Columbus. Adrian Aucoin registered his 4th assist for the Blue Jackets.